For those who don’t know me in real life–I’m a quarter Polish. My husband is like 99.9% Polish. We both grew up eating Polish food (although the Polish food my husband grew up eating is a bit more authentic than what I grew up eating). Both of our mother’s make Stuffed Cabbage. This is a delicacy in the Polish world, because let’s face it… rolling cabbage leaves and stuffing it with ground beef and rice isn’t the most glamorous thing to do on the planet. I will be honest. I have only made Stuffed Cabbage a few times. I always use my mother’s recipe. My mother’s version is sweet (hence the brown sugar) whereas my mother in-law’s recipe is salty. Both are equally delicious just very different. My mother learned how to make Stuffed Cabbage from her mother. This is a family recipe passed down from generations that one day (if I ever chose to) I can pass on to my children. I have not yet mastered the art of rolling Stuffed Cabbage. The cabbage leaves are delicate, the meat hearty… the cabbage must be at a certain consistency to easily roll without breaking. It is a lengthy process, but one that most of us take part in because, well… it’s tasty. 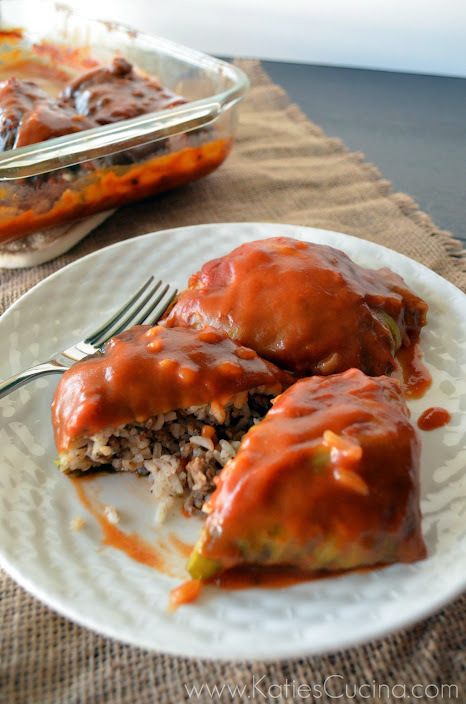 Whether or not you are Polish–I feel that everyone should try Stuffed Cabbage at least once in their life (that is unless you hate cabbage and/or ground beef then maybe I won’t force you to try it)! Fill a large stock pot with water, and cook on high until water is boiling. In a large skillet place ground beef and onions in skillet, and cook on medium-high. Breaking up ground beef as it cooks, and mixing around until all the beef is cooked. Drain well and set aside. While ground beef is cooking either cook white rice according to package or heat-up leftover rice and set aside. Add white rice to the beef/onion mixture. Season with salt and pepper to taste and 1/4 tsp paprika. Clean the cabbage well and cut the core off. Slowly peal each layer off the cabbage until you have 12 leaves (I like to peal two extra’s in case a few break or become over cooked in the pot)! Place a few leaves in the boiling water and cook for 2-3 minutes or until leaves are soft, but not falling apart. Gently remove the leaves, and repeat this step until ALL the leaves have been cooked. Rinse all the leaves under cold water and set aside. In a sauce pan add both cans of tomato soup and brown sugar mix well and heat for a few minutes on medium heat. Once the mixture is hot add the half and half and stir until well incorporated. Turn the heat off and let it sit with a covered lid. In a 9×12 pan spray with cooking spray and then ladle a few spoonfuls of sauce making sure that the bottom is well covered. On a clean work surface place a cabbage leave open and add 2 tablespoons of meat/rice mixture. Roll like a burrito and place seam side down. Repeat until all the cabbage leaves have been stuffed. If you have enough mixture for the remaining two extra and there is enough room in your pan make them (you won’t regret it)! Once all the stuffed cabbage is rolled and in your pan pour the remainder of your sauce over the top of the cabbage until all the rolls have been covered with sauce. Place tin foil on top of the dish and bake for 40 minutes. Let it cool for a few minutes outside the oven. Plate and ladle on more sauce before serving. Enjoy! Awe Ashely that is too funny! Yes, you should definitely give them a try again. Stuffed Cabbage with mashed potatoes? Never thought of serving them that way… We just always eat them as is with some rye bread! 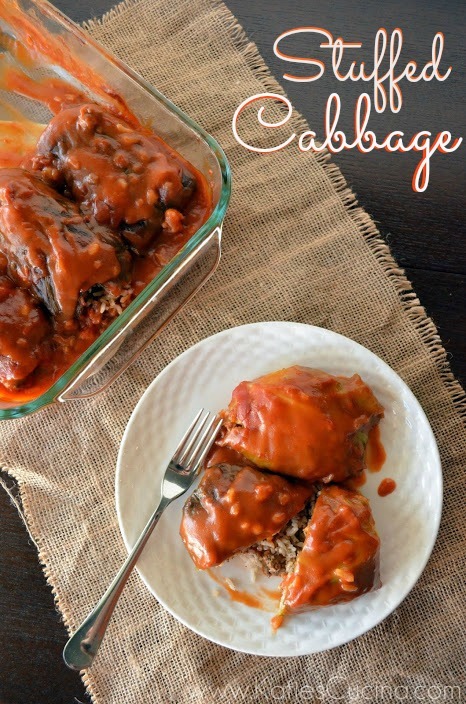 Only ate stuffed cabbage once when I was younger, my grandmother made it for me and I loved it! This will be the first time since then, can’t wait! Thanks Theresa. Do you remember if her sauce was sweet or salty? My MIL makes her sauce salty my mom’s recipe (this recipe) is more of a sweet tomato sauce. Either way–they are delicious! Good luck making it! I remember it having a sweeter taste! Perfect–then you’ll love this recipe!